How Much Does it Cost To Fly To Phoenix? The cheapest flights to Phoenix found within the past 7 days were $117. Prices and availability subject to change. Additional terms may apply. Denver Intl. - Sky Harbor Intl. Memphis Intl. - Sky Harbor Intl. Southwest Florida Intl. - Sky Harbor Intl. Liberty Intl. - Sky Harbor Intl. Friends say you have a warm heart. Where better to spend your next getaway than in the Valley of the Sun, where temperatures rise with the sun over gorgeous mountain ranges and laughter rolls with the currents down Salt River? Catch the next flights to Phoenix and wander through a Native American pueblo baked into the earth and watch the city’s famous sunsets stripe the sky in bands of purple and orange from a cacti-dotted mountaintop. And need we mention that Arizona’s capital city serves up Southwestern cuisine as succulent as the region’s signature flora? With excellent Phoenix flight deals, you’ll have plenty of savings just waiting for a splurge on delicious dishes, from tamales and margaritas to fry bread and sun tea. There’s that word, “sun” again—just a reminder that you’ll soon be drenched in golden rays. Your Phoenix flight touches down at Phoenix Sky Harbor International Airport (PHX), just 4 miles east of the downtown area. While downtown does have some bus and light rail options, getting there is easiest with a taxi or a rental car. Likewise, Phoenix roadways are a collection of fast-driving freeways and surface streets laid out in an easy-to-navigate grid. So book your car with Travelocity and start exploring as soon as you leave the airport. 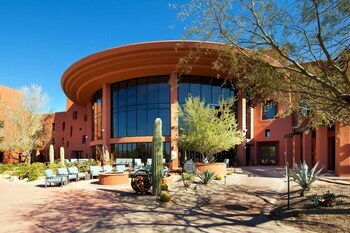 JW Marriott Camelback Inn Scottsdale Resort & Spa: Located in Paradise Valley, northwest of Phoenix, this resort the perfect place to escape the city without wandering too far. 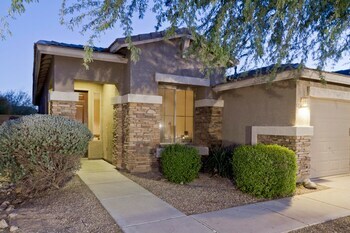 Wake up for a round of golf on the resort course or an early morning hike up Camelback Mountain, just 1 mile away. Follow up your busy day with a massage at the hotel spa. Pointe Hilton Squaw Peak Resort: Located near the base of Piestewa Peak—the second-highest peak in Phoenix, renamed after local hero Lori Piestewa in 2003—this resort is within steps of a scenic hike. Amenities include three restaurants and several pools for splashing away a heat wave with style. Arizona Grand Resort: As you fly down the on-site waterslides or lounge with a drink by the pool you’ll know exactly how this resort got its name. You’ll have a grand time fine dining, visiting the in-house spa, and working on your best strokes on the golf course. 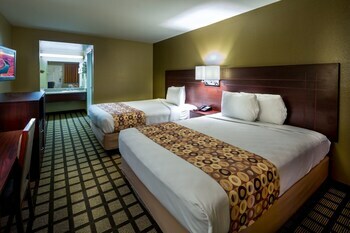 Pointe Hilton Tapatio: Breathe a sigh of relief as you sit beside the trickling fountains and relax in a homey suite. The bright, palm tree-accented exterior of this resort is reminiscent of vintage Latin American plazas while the luxury bedding offers a state-of-the-art night’s sleep. With history and culture around every corner, it’s no surprise that Phoenix has must-visit attractions located near the airport. Plane tickets to Phoenix are passes to some of the most breathtaking sights in the Southwest. Pueblo Grande Museum: Located directly northeast of the airport, this pre-Colombian archeological dig dates back to 450 BCE and was likely inhabited until 1450 ADE. Explore the ruins of the Hohokam civilization from intricate canals to earthen dwellings. Desert Botanical Garden: Farther to the northeast, the Desert Botanical Garden is home to scenic walking trails lined with indigenous desert plants. It’s the perfect place to watch the sunset and be surrounded by wildflowers and cacti. Salt River: Running along the south side of Phoenix, this winding body of water is the epitome of a lazy river. Rent some inner tubes or a raft, pack a cooler full of snacks and refreshments, then just relax and go with the flow. When you’re ready to shake off the chill of cool weather or you crave the views only red-rock mountains can give, it’s time to fly. Book the cheapest flights to Phoenix with Travelocity, thanks to our price-matching guarantee, and stay in a gorgeous hotel with the Sonoran Desert as your backdrop and cicadas for a soundtrack. Need insider tips on must-see attractions in Phoenix? Check out our Phoenix travel guide! The resort is beautiful, and the staff treats you like royalty. Will absolutely stay here again. Nothing unique about this property. Unless you find terribly dirty rooms unique. Fantastic pool setting for families and adults- byob and join the fun. 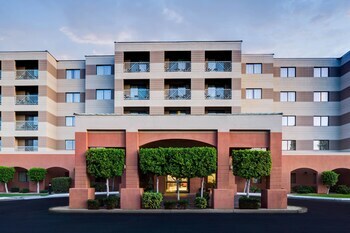 The 3 Palms is adjacent to the 60-acre El Dorado Park, 2 miles from Old Town Scottsdale, and 4 miles from Arizona State University.